Whenever Putin’s domestic popularity dips, he either escalates an ongoing conflict or launches a new offensive. And, clearly, it works. Putin has ruled the largest country in the world for nearly two decades, consolidating more control as he weathers each crisis. Ordinary Russian voters may struggle to survive on pensions of $200 each month, but Putin’s base can be proud to live in a superpower. To be sure, these steps earned Putin harsh criticism from Washington and Brussels. But condemnation from outside Russia only boosts his popularity within. With every foreign election the Kremlin meddles in, every violation of human rights in occupied Crimea, and every time Russian soldiers move barbed-wire fencing to carve out a few more acres of Georgia’s territory, the standard U.S. and European response—a diplomatic expression of “deep concern”—sounds more like a tired cliche. From the invasion of Georgia to the hybrid offensive in Ukraine, Western leaders have demarcated red line after red line for Putin to trample with impunity. The weakness of international norms, of the rules-based liberal order which many in Washington and Brussels endorse but few dare to defend, makes Moscow look ever stronger. In the eyes of his domestic supporters, Putin is calling the West’s bluff.But the status quo cannot hold. If we have learned anything from the past two decades, a new crisis is on the horizon. According to a March 7 poll by the Russian Public Opinion Research Center, Russian voters’ trust in Putin has fallen to 32 percent—the lowest level since 2006. True to form, Putin has been escalating provocations in recent months as his popularity has declined. 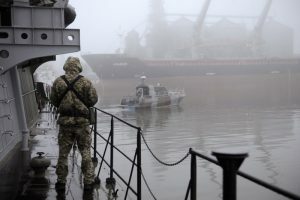 In November, Russian forces fired upon and detained three Ukrainian naval ships attempting to pass through the Kerch Strait into the Sea of Azov. More than 100 days have passed, and the outcry from the international community has long since died down. But the 24 Ukrainian sailors arrested during that incident remain in illegal detention. Putin’s violations of laws and norms in Russia’s “backyard” no longer seem to shock the world. He has already redrawn the borders of Europe by force and gotten away with it. Now, to provoke the West’s ire, he will have to do something even more egregious. It is not a question of whether he will attack, but where. Some point to Belarus, but Putin stands to gain little through a show of force in a country that most Russians already consider an integral part of Russia. Others predict that the Baltic nations of Estonia, Latvia, or Lithuania will be the next target. Putin certainly views the small Baltic countries as a threat; after all, they are functioning democracies on Russia’s border. But, for now, the Baltics are probably safe, for two reasons.First, the next frontier of Russian aggression is unlikely to be a NATO ally. The inconsistent responses of the West to Moscow’s various land grabs have only emboldened Putin, but he is not quite bold enough to risk triggering NATO’s Article 5—which could lead to all-out conventional war against a U.S.-led alliance. Putin understands when he is outmatched. If that weren’t the case, he would not have survived this long. Second, Putin’s next adventure will likely be outside the former Soviet Union. The West has grudgingly accepted his neoimperialist ambitions in the region. Further incursions into Ukraine, Georgia, or other non-NATO Soviet successor states would be deja vu all over again, which would do little to bolster Putin’s position. I have had the misfortune of getting to know Putin better than most people. Drawing on this firsthand knowledge, I predict a different direction of escalation. Russia’s most likely target in the near future is either Finland or Sweden; although both are members of the EU, they are not members of NATO. By attacking a non-NATO country, Putin does not risk a proportional response in accordance with Article 5. But by targeting a European country, he can expect to reap the rewards of public approval at home from voters who are desperate for a victory. This is a simple cost-benefit analysis that Putin has conducted, openly, many times before. Each investment of Russian force has paid dividends. Finland and Sweden meet both requirements. , like Sweden’s Gotland, considering the strategic capabilities Russia has built on its northern flank. After all, who would go to war over a frozen Baltic island or piece of Finland’s tundra? NATO wouldn’t, but Putin would—because the stakes are higher for him.Russian aggression on Scandinavian terrirory—in countries everyone in the West considers part of the West—might seem far-fetched. However, it was not long ago that Putin’s annexation of Crimea, which I predicted, struck even Russia hawks as an outlandish doomsday scenario. A few years earlier Russia’s invasion of Georgia, despite my dire warnings, also took the world by surprise. Former Soviet states, even if they are NATO members like Estonia, are widely perceived as not quite Western. This perception may be inaccurate, but in politics, perception often matters more than reality. For Finland and Sweden, though, perception and reality are aligned. They are not ex-Soviet republics; they are unquestionably part of the West. From Georgia to Ukraine, Syria, and beyond, Putin’s trajectory has been clear. By defying the norms imposed by the West, he has—in his view—taken progressively greater steps toward emancipating himself. But he will only achieve full emancipation by confronting the West directly. This may sound shocking, but Putin has shocked the world many times over. The West cannot afford to be caught off guard again.